With over 25 restaurants across the Carolinas and Tennessee, Hickory Tavern has become a popular spot for eating and/or drinking while watching sports. They’re like Buffalo Wild Wings more posh sister. Though their vibes are similar, Hickory Tavern is a little more classy and grown up, but still knows how to throw down. For instance, on our most recent visit, it was Karaoke Bingo Night. It’s exactly like it sounds-the host plays a song for about 2 minutes. If it’s on your game card (a sheet of paper comprised of 4 boards), then you mark it with a crayon that’s provided. It was an entertaining way to pass the time while waiting on our food to come (though we still played while eating dinner). It had been a while since we’d been to Hickory Tavern. Nikki and I were with our dad and trying to figure out where to go for dinner. My dad suggested Hickory Tavern. I called one of the locations to ask if they had a gluten-free menu (obviously, the answer was “yes”). While only offering two appetizers, they have five Tavern Specialties (most places still don’t offer dessert, which is just rude), three Skinny Plates, three steaks, and several sides. 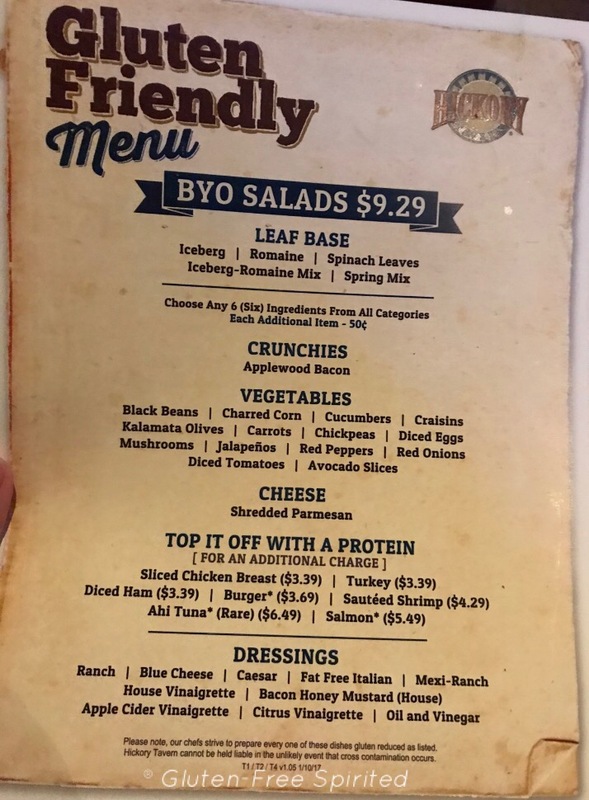 Another offer is a variety of BYO (Build Your Own) salads that you can customize with leafs, cheese, proteins, and dressings. 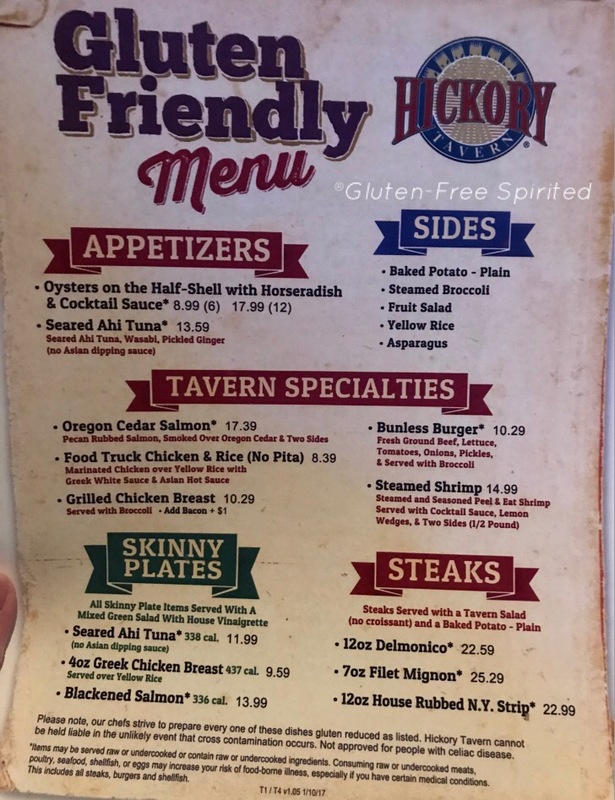 Hickory Tavern has a decent variety of options for patrons with dietary restrictions. BYO Salad isn’t at all like BYOB. As with many restaurants offering gluten-free menu items, many of them still contained soy and/or dairy. 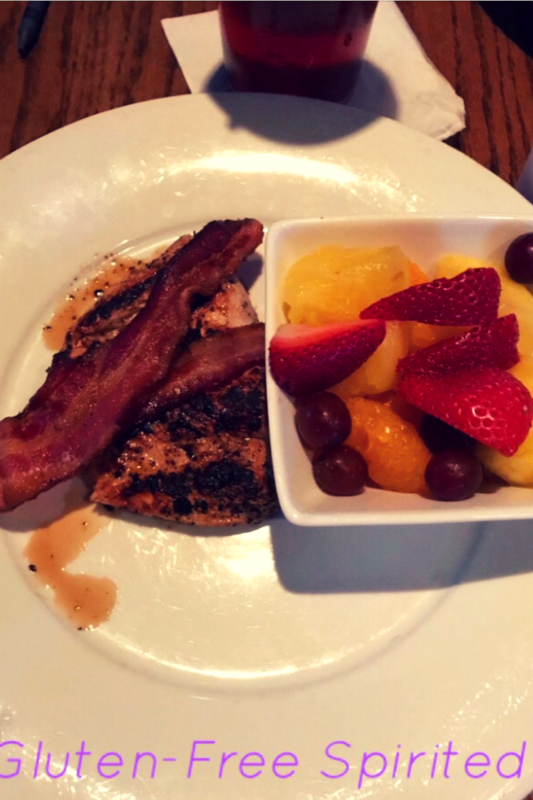 *wompwomp* After asking questions about soy in several items, Nikki finally chose the grilled chicken sandwich (minus the buns) with bacon with a side of fresh fruit. She can’t eat buns, hon. If you are new here, this is the portion of the blog where I post what I ate. Since I don’t have dietary restrictions, my meals typically contain gluten, soy, and/or dairy. 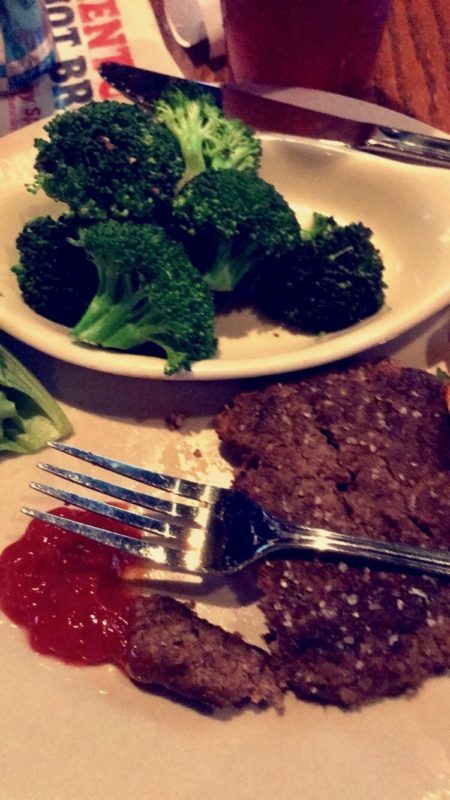 If you don’t wish to have food jealousy, please scroll…NOW. I chose the Southern Burger which features Applewood smoked bacon, shredded Cheddar & Jack cheese (there is indeed cheese somewhere on that burger), Sweet Baby Ray’s BBQ sauce (yaaaas!) topped with crispy onion straws. This was so big that it provided lunch the next day. 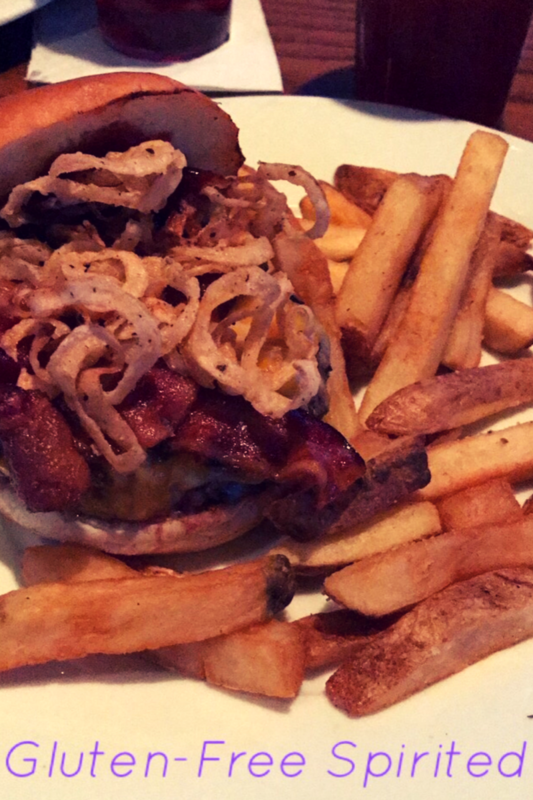 If you want to know what to order at other restaurants, check out recommendations at Kickstand Burger Bar, Smashburger, Cracker Barrel , and Golden Corral . Don’t forget to follow GFS on social media, share this review with your friends, and subscribe for future blog updates! It’s crazy how many people gluten affects. 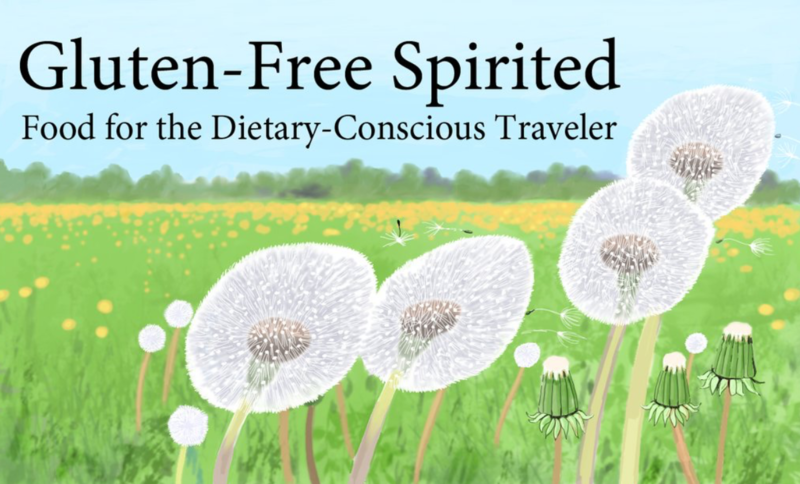 I always wonder about how gluten-free and or vegan people fair when they want to go out. There’s so many unknown ingredients in things and it’s nice that restaurants are being more thoughtful and accommodating. Eating out is always a task since we have certain restrictions as well. I do love that a lot more resturants have been providing more details on what is in the foods they serve. It makes dining out a much better experience. Plus how awesome is karaoke bingo?!? I would love to play that! As some one with a lot of dietary restrictions, I soo appreciate when a restaurant has a dedicated GF menu. Makes me much more likely to go back there again and again! Looks like you had a good time there. I appreciate that they have a decent vegetarian option. Thanks for sharing your review. It’s really great when everyone can be included. I’d never even heard of karaoke bingo before that night, but it was fun! I love how you have options in your post reviews for everyone! Everybody’s needs are different and I like how you try to include that when you go to a restaurant. Thank you, Jin! It’s great that more & more places are starting to include options for everyone. Having options when going out to eat is always important especially gluten free options. Thanks for sharing these options available at Hickory Tavern. It really is, especially when trying to go out with family or friends. I didn’t really ever think about it until she was forced to make the changes. Just going grocery shopping was a hassle (it’s gotten easier). It is a very cool place to chill and have a relaxed meal. I’m gluten free and eating out is ALWAYS less than easy. Love when I find restaurants that not only offer options but actually have a menu too!! This place looks great. It can really be a hassle to find places that my sister can eat at too. I agree! It’s so nice when they offer more than 2 or 3 items. This really looks so delicious! I have always wanted to try anything that’s gluten free. Thanks for sharing this. You’re welcome! It was very good. I love it when restaurants give options that are no less delicious than their full menu for those who may have dietary or tastes restrictions. This all looks so delicious! It was good! My sister has discovered (as have I because she usually lets me try stuff) that many gluten-,dairy-, and/or soy-free options taste as good as the “regular” options. Ooh always good to hear that places are getting better with gluten free although I think I’d still really struggle here as I’m veggie too! So many people have various dietary needs/preferences and it’s nice when restaurants make the effort to include menu items for more customers. I’ve read and learnt more about gluten free stuff here than I’ve read from any other nutrition sites! I guess this covers the more lifestyle way, reminding me along the way how a particular food or dish actually has gluten! There are no Hickory Taverns in Minnesota. Which is a shame, because they sound so good. Next time I drive to the Carolinas I’ll have to check one out, now that I’ve seen your blog. Eating out when you need to follow a gluten free diet is such a hassle! I am so happy that this place has what people like me need and with variety to boot! We need more restaurants like this one 🙂 I know it is not always easy to accommodate everyone, however making an effort to have a few items does make a difference. Its really awesome that restaurants are becoming gluten-free inclusive. They’re a lot of restaurant going that struggle to find things to eat. I too don’t have a dietary restriction, I cut a good bit of dairy out of my diet. Many people who are in diet won’t hesitate to grab this awesome opportunity. They struggle to eat many favorite foods they want while controlling it. Now, this is such a good news for them. it’s always difficult when traveling to find a good meal that sticks to your special dietary restrictions – especially without an eye roll. great post! Exactly, Tara! My sister always has to ask a lot of questions about how things are prepared since so many establishments use soybean oil to cook with. Wow I love their selection and accommodations! Gluten is seriously one of the silent torture things that too many people are affected by. I’m glad that places like this are getting in board! It’s really great that they have so many options. Restaurants that do provide options generally only have one or two items.